October 23, 2012 - The vertical tail plane of the first flyable A350 XWB (MSN1) has just come out of the paint hall in Toulouse, France sporting the well known Airbus blue and white insignia. This is the first A350 XWB component to be painted with the Airbus insignia. The 10 meter tall, composite vertical tail plane is produced, as for all Airbus aircraft, at Airbus’ Stade site in Germany. The vertical tail plane is joined to the fuselage using an innovative, lighter connection that is also more aerodynamic. The external insignia of the A350 XWB, including the vertical tail plane, is painted with an environmentally friendly, chromate free primer paint. In addition, following best practice from the car industry, Airbus will use a new base coat/clear coat system which requires less paint and less solvent. This eco-efficient painting process also means that less detergent will be needed when washing the aircraft. Inside, Airbus will use a water-based paint wherever possible, one of the most environmentally friendly types of paint available. 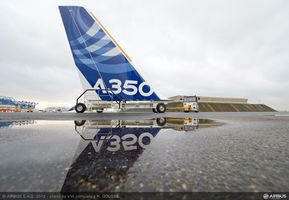 The redesigned A350 was marketed by Airbus as the A350 XWB, where the XWB stands for Extra Wide Body. The launch customer for the A350 is Qatar Airways, which ordered 80 aircraft across the three variants. Development costs are projected to be US$15 billion. The airliner is scheduled to enter airline service during the second half of 2014.